Changes in core and/or skin temperatures are a consequence of an imbalance in heat production and heat loss. The single most important factor to do with heat production is metabolic rate – basically, how hard you’re working. Less than 20% of the energy we create during exercise goes towards moving – we are very inefficient. Most of the remaining energy creates heat. Additional factors, such as the ambient temperature and the relative workload, also contribute to increasing heat storage. What this means is that the hotter it is outside, and the closer to your own VO2 Max you are, the greater the rise in core temperature. This is especially true when the ambient temperature is higher than skin temperatures, which can lead to a heat gain directly from the environment. While we most often measure core temperature as a proxy for heat gain, exercise results in some heat storage in “shell” parts of the body, such as the skin and skeletal muscle. Importantly, heat generation is immediate upon exercise – but the heat loss mechanisms are more gradual. Thus, the higher the initial workload, the greater a rise in initial core temperature before cooling kicks in. So it’s better to start slow to minimize the initial heat gain before the body can fully cool itself. As core temperature increases, it takes 30-60 minutes for the two major cooling mechanisms of the body to kick in. The first, evaporative cooling, is heat loss through sweating. Evaporative cooling is controlled by sweat rate, the number and location of sweat glands, airflow and the humidity of the air. Usually, it increases as the ambient temperature increases (depending on humidity). The second type is convective cooling, in which your body acts like an air conditioner, directing warm blood to the skin, where its proximity to the cooler air results in the transfer of heat from the blood to the air. Conductive cooling is dependent upon the difference in ambient temperature and skin temperature and is greater with increased air flow. Conductive cooling is less and less important for heat loss as the ambient temperature rises, while evaporative cooling becomes more important in warmer temperatures. Both conductive and evaporative heat loss total depend on body surface area, with more body surface area leading to more cooling. A consequence of this is that smaller runners, who have a greater body surface area (cooling potential) to mass (heating potential) ratio are better at cooling themselves compared to larger runners who have a smaller surface area to mass ratio. Without question, hot weather slows us down. As early as 1916, scientists recognized that exercising in heat resulted in “drafting blood away from the brain and the muscles to the skin” and likely caused “depression of cerebral activity.” Indeed, subsequent research indicates both the cardiovascular and central nervous systems perform worse in heat in a variety of ways. The cardiovascular system shifts blood flow from working muscles to the skin, which decreases the amount of blood returned to the heart, and thus lowers cardiac output and VO2 Max. To compensate for the decreased cardiac output, the heart rate increases, at even submaximal workloads, such as the intensities of ultras. Another compensatory mechanism of the increased skin blood flow is decreased gastrointestinal blood flow, which is associated with GI distress. Central nervous system mechanisms can also worsen performance. Researchers have found that an increased core temperature is associated with increased central fatigue and a decreased mental ability to voluntarily contract skeletal muscle. Altering central fatigue through specific neurotransmitters or deception (as discussed last issue) also alters voluntary maximal contraction, providing additional evidence that central nervous system mechanisms slow us down in the heat. While we understand the general mechanisms of how heat effects the cardiovascular and central nervous systems, the details of these interactions remain an active area of research. As mentioned above, our surface area to body mass ratio alters our ability for conductive and evaporative cooling, with smaller individuals performing better than larger ones. While we can’t change that variable (much), there are specific methods we can use prior to and during exercise to help lower core temperature and improve performance. Prior to exercise, combining a variety of cooling methods, such as wearing an ice vest and drinking or immersing oneself in cold water, leads to lower core temperatures and improved exercise performance. Cooling during exercise – by using an ice vest, drinking ice water or applying cold packs – improves exercise performance in hot conditions, but the data suggests wearing an ice vest results in the largest improvement. While these techniques may work on race day, the best technique requires some effort in the weeks prior. 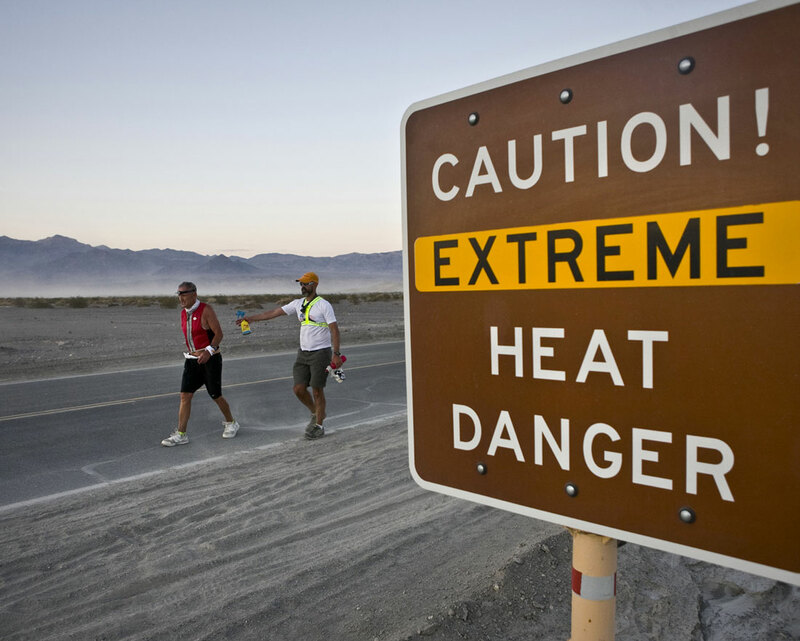 Repeated exposure to heat is the single best way to improve performance in hot conditions. The US army has developed a protocol that maximizes acclimation. Exposure to hot (40°C, 20% humidity) temperatures for 100 minutes a day while performing very light exercise to help elevate the core temperature will result in acclimation (increased blood volume, better retention of electrolytes, better sweating and lower heart rate) within 10-14 days. Passive heating, such as a sauna or hot tub, can work, but is considered less effective than exercise. Heat acclimation should never be done alone, as many people cannot get through even the first day of the protocol developed by the US Army. Even less extreme protocols will result in significant heat adaptation. More recent evidence also supports the idea that heat adaptation can improve performance in cooler conditions as well as hot conditions, and should be considered for any temperature event. However, once acclimated, adaptations to heat are lost quickly, with a majority of losses occurring within two weeks of adaption, and the loss of adaptations seen as quickly as a week. Thus, proper planning is necessary so your sauna experience is not a waste. So don’t sweat the day to day, and enjoy cooler weather until a few weeks out from race day. @Matt I was just forced to drop at approximately mile 65 of the KEYS100 held in the Florida Keys. The temps/humidity were record highs for the event. I live in Central Texas and was able to get sometime in the heat, but no where near the humidity, and some 30+ minute sessions in the sauna before hand. I was trained and am experienced at the distance. I was consuming between 30-40 ounces an hour, sometime more, and my energy levels and cognitive skills were good through out. I’m a bigger runner (6’4″ 185 lbs.). Question? While it seemed me and my crew we where doing everything right (drinking, fueling, cooling, pacing) I was spooked as I only marginally urinated only four times in nearly 17 hours. This is the first time I have experienced consuming large quantities of fluids and producing virtually no urine. This started early in the run and continued until I dropped. Shortly after stopping the floodgates opened. Any ideas what was going on with my body? @smbern:disqus I forget the mechanism or chemical, but I believe it’s the same as when you sleep, that allows you to not pee during an ultra and not be dehydrated. This happened to me at the Lake Sonoma 50 where I did not pee the whole race (almost 11 hours) but I was relatively well hydrated. It was not a hot day. I’m not sure if that’s what happened to you, but what happened after you dropped makes me think it was a psycho-chemical thing. The science of ultrarunning podcasts has a great one about hydration BTW, where they say weight loss is the best objective indicator of dehydration. I suspect you were probably sweating it out and perhaps you are a heavy sweater which would also likely made you pee less.